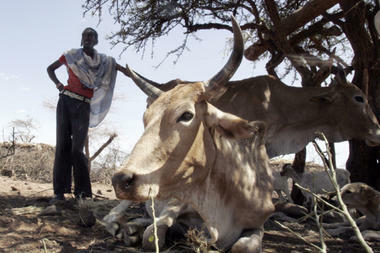 Satellite data of climate activity enable remote herders to obtain drought insurance. 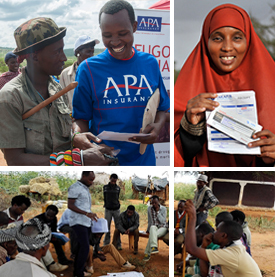 Dusty northern Kenya doesn’t look like a laboratory, but across its dry plains, cattle herders are pioneering a new way to fend off poverty and teaming up with unlikely partners – insurance agents. The two groups have been brought together by the International Livestock Research Institute (ILRI), headquartered in Kenya’s capital, Nairobi. A few years ago, scientists at ILRI wondered if a new innovation, called weather-indexed insurance, might help impoverished cattle farmers survive the loss of their cows during times of drought. For the cattle, camel, and goat herders in Marsabit, a dry part of Kenya that shares a border with Ethiopia, animals are assets. Their sale can bring the income a family needs to survive, and a big herd, like a big house, is a store of wealth that can be useful collateral for credit, which analysts often say is key to pulling people out of poverty. At minimum, losing a cow is a devastating financial blow. That’s the kind of risk that insurance can defray, but insurance agents aren’t going to travel to Marsabit to verify cattle deaths. “We really wouldn’t have even begun … a traditional [insurance] process. It was very clear for us at the onset that it wouldn’t work,” says Andrew Mude, chief scientist with ILRI.